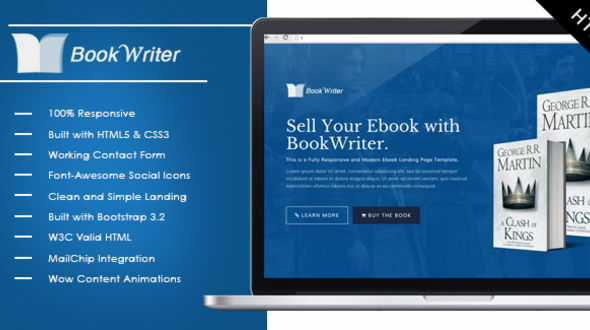 BookWriter is a minimal ebook landing page built with bootstrap 3.2. This is fully mobile responsive template ideal for any book marketing campaign. BookWriter is very easy to customize with clean well-commented codes. You can easily customize the theme to fit your needs. Get it now! Note: Images Used Are For Presentation Purpose Only. Images credit to HBO Game of Thrones (Just a fan of Book and Show) Support: Customer satisfaction is our top priority; don’t hesitate to contact us using the contact form on our profile page or jlpdesignmedia@gmail.com if you require any assistance. Will try to reply within 24 hour.